Youngblood's Foundation Kit in 'Golden Tan' has been carefully curated to help you create a flawless complexion with long-wearing results. The primer, liquid foundation and setting powder work in synergy to lay down the perfect base, while the mineral blush adds a natural-looking flush to cheeks. Complete with a limited edition bikini bag. Ideal for dry to medium skin. A moisturising liquid foundation formulated with a Deep Sea Hydrating Complex to leave dry, parched skin feeling replenished and radiant. Enriched with a special blend of Deep Sea Water, botanicals and over 20 ocean minerals, the foundation blends effortlessly onto skin, creating a more even-toned canvas while soothing and revitalising. Long-wearing and silky, the makeup will leave skin looking perfected and virtually pore-less. For medium, warm undertones. Paraben free. 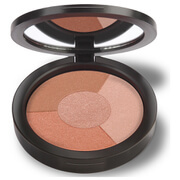 A loose mineral blush with buildable coverage. Perfect for adding a flush of natural-looking colour to cheeks, the blusher lays down a subtle hue to add warmth and radiance to the complexion. Packaged with a sifter component for dispensing the perfect amount of product for zero waste and mess. A lightweight makeup primer that creates a flawless canvas for long-wearing makeup. Infused with a cocktail of vitamins and minerals, the silky primer preps skin to receive foundation; it helps to smoothen the appearance of fine lines and pores for a perfected base. Colour-free. A sheer finishing powder that helps to banish shine and prolong your makeup look. Promoting a shine-free yet radiant complexion, the setting powder helps to hydrate and balance, locking in moisture while naturally absorbing excess oil and shine that can cause makeup to slip away. Skin looks airbrushed and makeup stays looking freshly applied for hours. 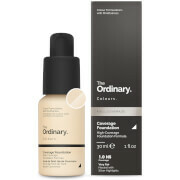 Foundation: Apply one pump of Liquid Mineral Foundation to the back of a clean hand. Pick up a small amount of product with the tip of the Liquid Foundation Brush; smooth out any excess. Beginning at the centre of the face, gently apply in even strokes. Blush: To contour cheeks, jaw line, nose or brow: Choose a darker blush, such as Adobe. Apply with the Youngblood Contour Blush Brush, feather and blend, then choose a lighter colour such Dusty Pink or Plumberry and apply to the apple of your cheek with a Youngblood Super Powder Brush. Using a swirling motion, softly blend the blush downward. Touch-dust overall with Youngblood Rice Setting Powder for the softest of looks. Finishing Powder: Apply over face with a brush before or after makeup. To reduce the appearance of large pores, use a Flocked Sponge to press the powder into skin. Foundation: Water (Aqua, Eau), Cyclomethicone, Hexyl Laurate, Glycerin, Reduced Salt Deep Sea Water, Dimethicone, Butylene Glycol, Polyoxyethylene, Methylpolysiloxan, Dimethicone/ Vinyl Dimethicone Crosspolymer, Sodium Chloride, Lauryl PGG/PEG-18/18 Methicone, Squalane, Camellia Sinensis Leaf Extract, Natto Gum, Cereus Grandiflorus (Cactus) Flower Extract, Salix Alba (Willow) Bark Extract, Plantago Lanceolata Leaf Extract, Chamomilla Recutita (Matricaria) Flower Extract, Magnolia Biondii Bark Extract, Sorbitan Sesquioleate, Citrus Grandis (Grapefruit) Fruit Extract, Propolis Extract, Calendula Officinalis Flower Extract, Thujopsis Dolarbrata Branch Extract, Allantoin, Cucumis Sativus (Cucumber) Fruit) Extract, Disodium EDTA, Fragrance (Natural Fragrant Essential Oils– Lemon, Orange, Ylang Ylang). May Contain: Titanium Dioxide (CI 77891), Iron Oxides (CI 77491, 77492, CI 77499) PAO 12M. Finishing Powder: Silica, Dimethicone/Vinyl Dimethicone Crosspolymer, Glycyrrhiza Glabra Root Extract, Menthol, Menthyl Lactate, Tocopheryl Acetate, Smithsonite Extract, Rhodochrosite Extract, Caprylyl Glycol. May Contain: Iron Oxides (CI 77491, CI 77492) PAO 24M.